No one is going to argue about the exponential cute factor of a puppy and kitten together! As illustrated in the photo above, the combination has amazing “aweeeeee” power. That’s is me holding one of my foster kittens and a foster puppy. What you can’t see is my happy but very tired face! Puppies and kittens are babies and like human babies they take a lot of time, energy, and cleanup. If you’re thinking about adopting or fostering puppies and kittens together, I’ll share my experience and Top 4 Tips so that you can be prepared with lots of paper towels for the poopy moments and your camera for all the adorable moments too. 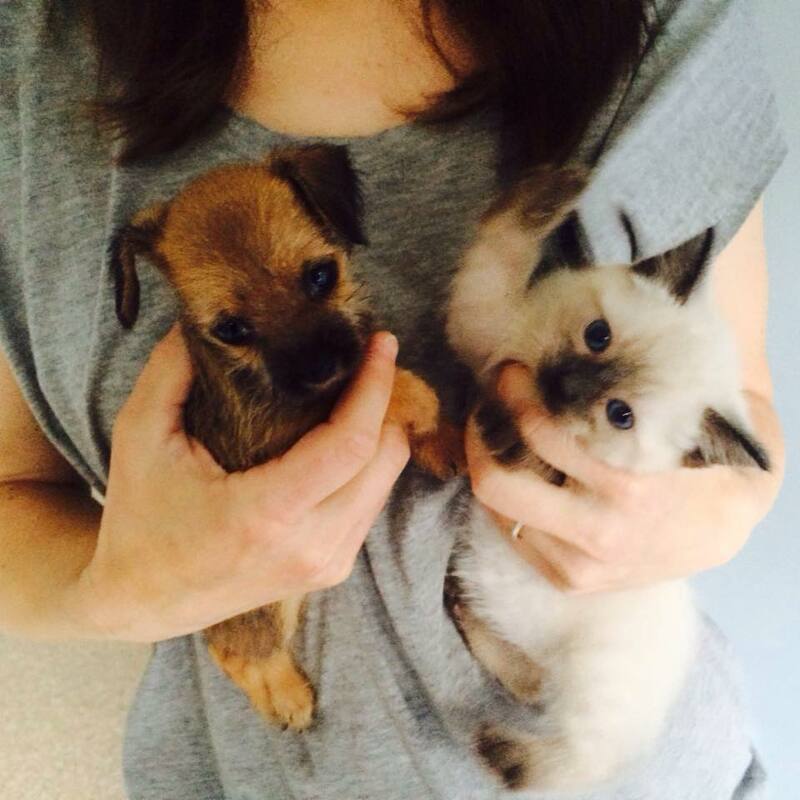 So, should you adopt a puppy and a kitten at the same time? My advice, after fostering both at the same time, is you should know it is a lot easier to only have one baby in the house at a time. The advantages are if you have the time, energy, and setup, your puppy and kitten(s) will grow up used to each other. “Older” puppies and kittens (like 6 months to 1 year old) are a lot easier than tiny baby kittens, and still young enough to grow up together. Plus many adult cats and dogs can not only learn to get along but love each other too. I didn’t set out to be fostering both puppies and kittens at the same time, but springtime in many parts of the world means baby animals. Also in many places, like here in Los Angeles, too many babies means not enough cages and foster homes for them all. When a shelter volunteer asked a local rescue to save two baby kittens that only had until the end of the day, I turned my bedroom into a foster isolation area so they could say yes. That way I could foster them separated from my other pets for a few weeks until everyone was vaccinated and healthy. The kittens got their vet check and kitten treatments and were a happy and healthy little pair. Then a friend who works long hours was unexpected given this baby puppy at work. First thing puppy went straight to the vet, to make sure the she didn’t have any illnesses or parasites the kittens could catch or vice versa. She was so tiny — only 1 and a half pounds — just a tiny bit smaller than the kittens! Not knowing how they’d get along, we set up the puppy in a crate in the corner of the kitten room. The kittens were fearless and curious about their new visitor. They spent a day getting to know each other through the crate door, then were fully introduced. If puppy is bigger than kittens, you may want to hold puppy on a leash so kittens can run away and get out or range if puppy is starts playing too rough. Monitor when together! You need to be the “mom” dog/cat and intervene SEE VIDEO BELOW if playing gets too rough. Listen for meows or puppy squeals. Most puppies and kittens can learn to play with each other without biting too hard, but they have to learn to control the force of their bite — that’s called bite inhibition. Introduce slowly by letting puppy and kitten(s) play together as long as they both seem happy. You may need to do many short sessions building up their time together. Keep litter box and kitten food away from puppy. This can require some inventive thinking! If you have a tiny puppy and bigger kittens, a high-sided litterbox that the kittens can get in and out of easily but puppy can’t can work for when you’re there supervising. Use non-clumping litter— ask your vet for a recommendation of the type that is the most safe if puppy accidentally eats some of it, like if kitten jumps out of the box with some stuck to her foot and puppy then eats it. VIDEO: Video of puppy rough play kitten intervention redirection to toy. Watch this video below to see how to gently intervene and redirect a mouthy puppy on to a toy when puppy is playing too rough with a kitten. Enjoy your adopted puppies and kittens! You can download our free puppy help guide The Puppy Manual here.